Architect seeking a supplier of high-quality, handmade furniture? When working on the perfect project, you need the perfect partner. Why would you ask for anything less? At Mac&Wood, perfection for your project is our goal. If you are looking for furniture to suit a specific space, design vision or client please get in touch. One of our expert craftspeople will get to know your requirements, take you through our service, and create a bespoke set that will surpass your expectations. We can even look after the full delivery and installation, whatever the size of the project. Customisation is at the crux of our production process. All our designs can be adapted in whatever way required to meet your needs, and entirely bespoke items can be created from scratch at your request. We aim to make sure that every item of furniture we create in partnership with you is made exactly for the space for which it’s destined. Our craftspeople will collaborate with you during those intricate, all-important preliminary stages of the project, from listening to your requirements for style, atmosphere and design, to taking and adjusting measurements, to supplying scaled plans if required. At every stage along the way, we’ll keep you in the loop and up to date with the latest developments – ensuring that you are always in control of your order. Our aim is to harmonise a customer’s lifestyle and aesthetic vision, fusing purpose and passion into sublime, irreplaceable furniture. Our bespoke pieces are built to last a lifetime, and our range of exquisite materials and furniture designs cannot be surpassed. They are designed to maintain their character from the moment they cross the threshold of the home and through each passing year. Our tables are created from extremely durable and hardwearing materials – naturally strain-proof, burn-proof, scratch-proof and dent-proof. 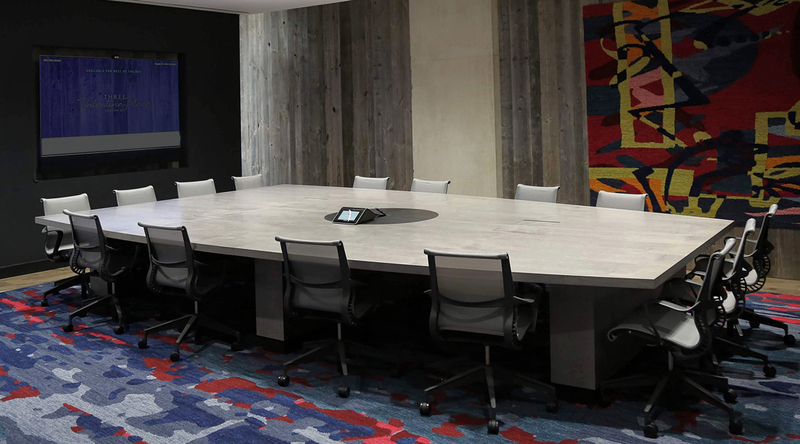 They are fitted with brushed stainless steel and can be made large enough to accommodate large meeting rooms with a huge range technology enabled add-ons. They are perfectly suited to any environment and any size of project.